A regular tetrahedron is constructed within a unit cube in such a way that its four vertices coincide with those of the cube – see the diagram. If you have been following this week’s questions, then you’ll find the above pretty simple. So, let’s increase the difficulty dial! Imagine constructing another regular tetrahedron using the other four vertices of the unit cube. 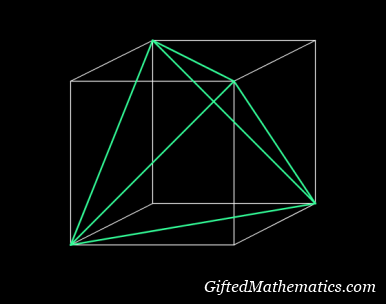 The space where the two tetrahedra overlap is known as the core. What is the name of the polyhedral core? What is the volume of this core? You may submit at least one answer to enter the competition. Send your complete solution by email to pmq16euclid@giftedmaths.com. This email address shall be removed after the competition closes to avoid spam. This PMQ16 competition closes on MONDAY 29 April at 23:59 GMT - one extra weekday from now on.